Happy Birthday to Rabbie Burns. 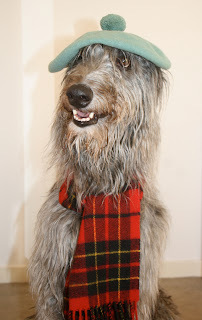 Today, deerhounds everywhere should be looking forward to tucking into a wee piece o Haggis, alang wi ‘tatties and neeps’ to celebrate the 250th anniversary o’ the birth o’ The Bard. To celebrate this anniversary, there is so much going on, infact a full year of celebrations begin in Scotland. 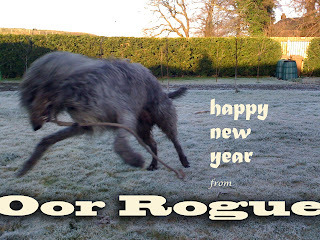 All Scottish deerhounds who have ever considered visiting their country of origin – this is the year to do it. The year of Homecoming. What’s more the deerhound club are holding their annual breed show at Dunblane hydro from the 17th ’til 19th of April 2009. Why not come along and visit? For further information on Dunblane follow this link. To enjoy a recital of the above work by HRH The Prince of Wales follow this link. Further links for Rabbie Burns and preperations for Burns suppers can be found by clicking the links within todays post and should you want music for this evenings Burns Supper – go here to visit the world's first website to offer every single Burns song as a download. Here’s a fine little piece of art I can tell you little to nothing about. I don’t know the period from whence it came, if it’s gold and silver, nickel and more nickel or if it is a one off or mass produced object. 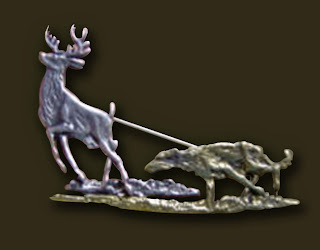 What I can say is it measures no-more than two inches across and clearly depicts a deerhound in pursuit of the quarry. What can you tell us about this brooch?